Special shout out to Josh – thank you for letting me crash at your place when you were in Germany. As I would have expected, your kitchenware and utensils were nothing but the best and finest quality! I had fun cooking in a different setting. I hadn’t intended the meal to be vegetarian, it was more of cooking a hodgepodge of random food items I had been craving. But as soon as I brought out the dinner plate, someone promptly asked, “where’s the meat?” Haha, oops! 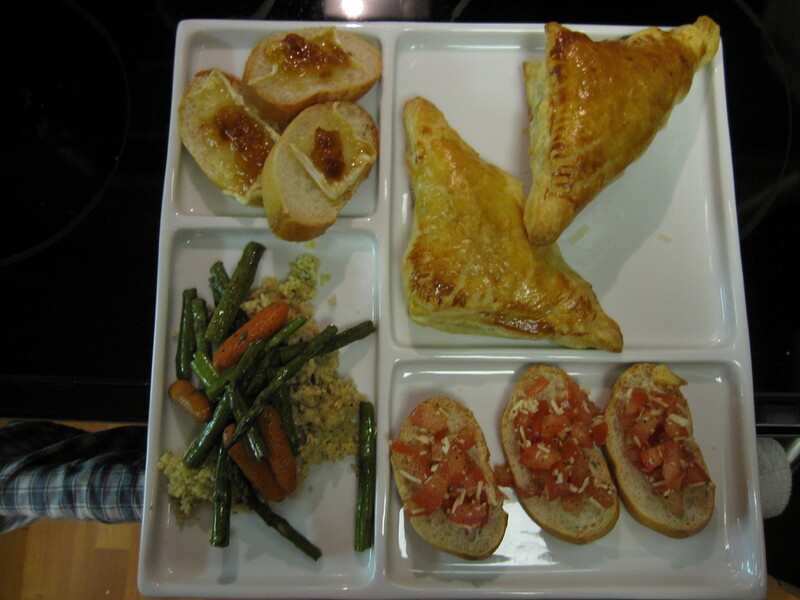 Clockwise: Baked brie and apricot jam on toasted baguettes, spinach/mushroom/onion puff pastry, bruschetta, and grilled veggies over a bed of couscous. The baguettes for the baked brie with apricot and the bruschetta were from French Riviera Bakery. I first found out about the FRB from Yelp (of course). Their pastries are yums, especially the chocolate almond croissant. The first time I was there, I noticed that multiple people would come in just to buy their baguettes, so I thought I’d give it a try. Pretty good, but nothing to write about? I’m sure they are much better when they are freshly eaten. I first sauteed frozen spinach, chopped white onions, and chopped mushrooms together. S&P, and of course, nutmeg. Afterwards, I added shredded mozzarella cheese to make all the ingredients stick together. 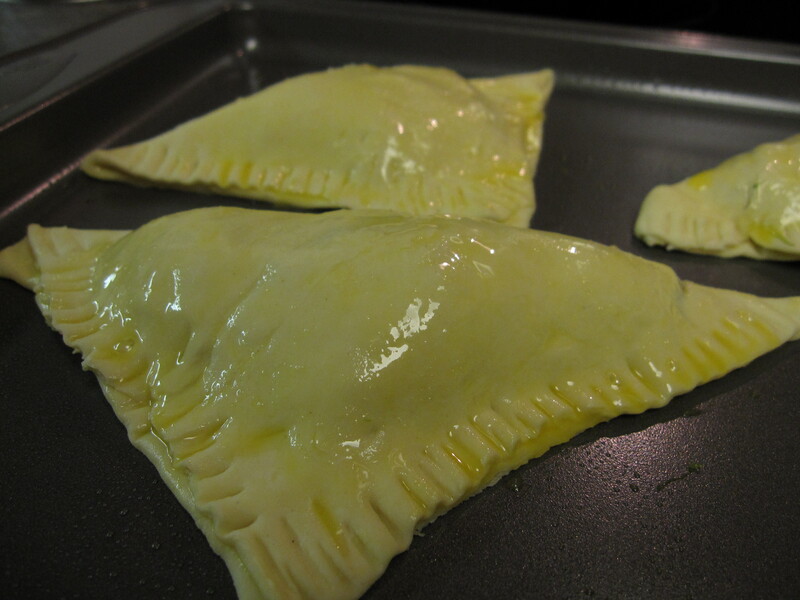 Then I spooned the mixture into the puff pastry dough (I used Pepperidge Farm), kept together by pushing fork imprints on the sides, and brushed the top with egg. Baked for 10 minutes at 375 degrees. 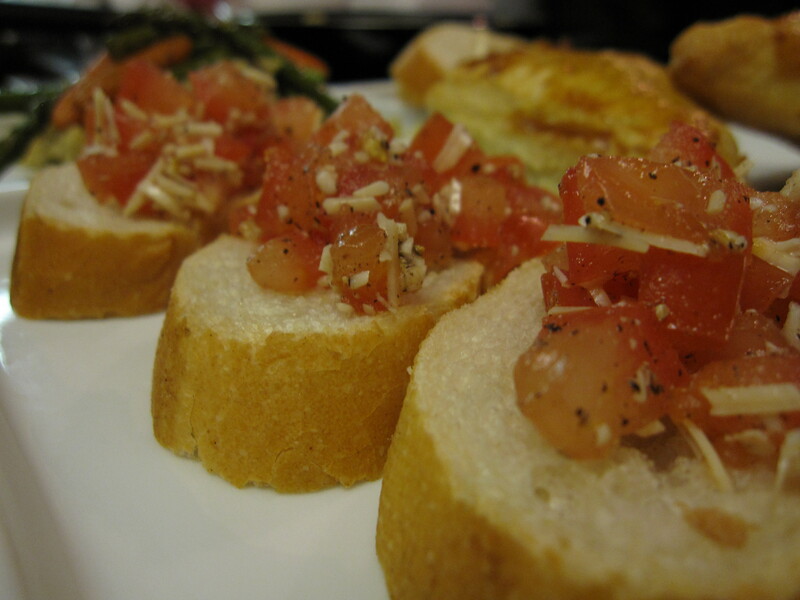 The bruschetta was just chopped tomatoes, S&P, EVOO, parmesan cheese, and lots of minced garlic. I forgot to buy basil, oops. 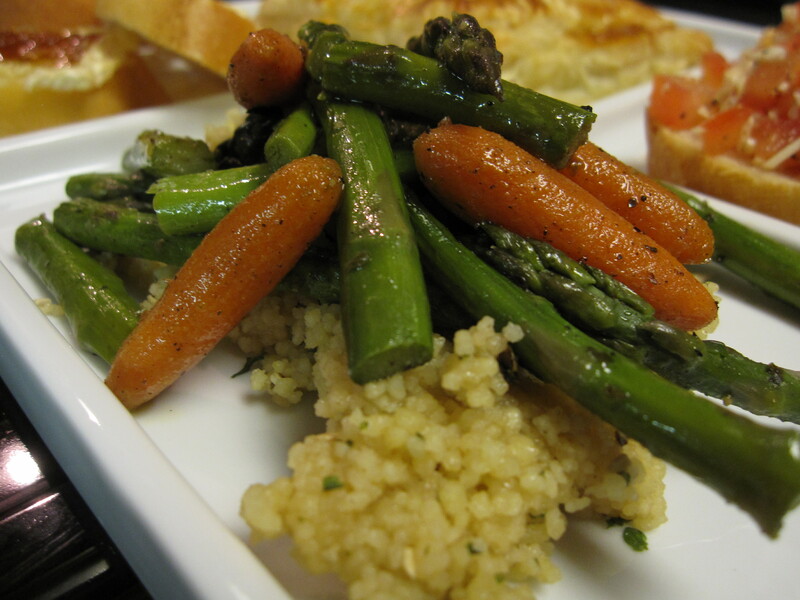 Finally, the couscous and roasted vegetables. The carrots and asparagus were baked covered with aluminum foil in the oven at 400 degrees until tender, roughly 30 minutes. Couscous was made from the box. I love saying the word couscous and eating couscous. 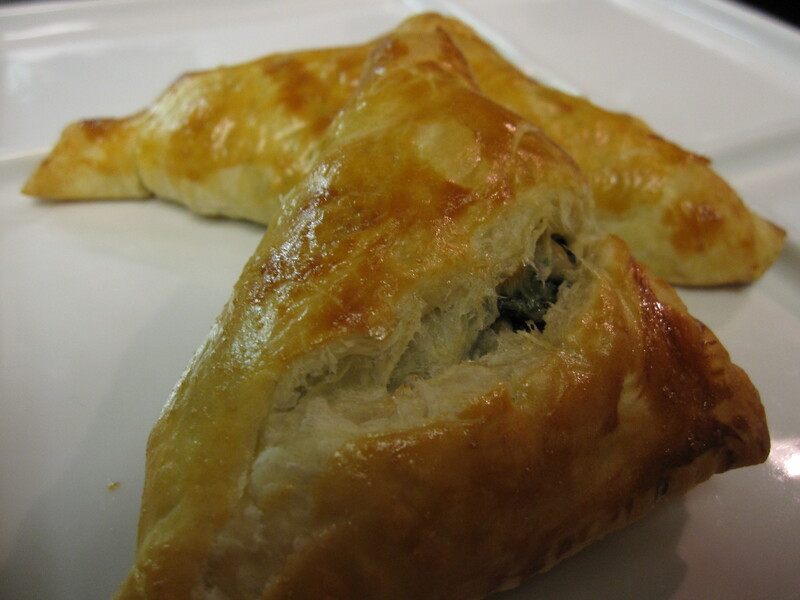 I feel like if I started making those delicious puff pastries, I could eat about 35 of them. Would you make those an entree or a side? And if a side, what entree would you pair with them?